The rate of change initiative failures are high. Culture and people focus can impact the success or failure of change initiatives. Leading and managing people through change can mitigate failure rates. Are change initiatives more likely to fail than to succeed? In Soul Searching: True Transformations Start Within, Bain reports that “only 12% of companies achieve their full transformation targets”. This is according to a recent Bain survey of “senior executives who have led large-scale change programs”. Bain also shared that “the good news is, the share of total failures—companies that missed their ambition by a wide margin—dropped sharply to 20% from 38% in 2013. In 2008, McKinsey surveyed 1,564 business executives worldwide, on the success of their change initiatives. Only 30% considered their efforts successful, according to Enclaria, in It's Time to Abolish the 70% Change Failure Rate Statistic. In 2009, IBM shared a study of over 1,500 change practitioners, published in Making Change Work,3 in which 41% of projects were found to have met their objectives. The remaining 51% missed at least one objective of their change programme, or considered the project a failure. The Executive Development Blog reports that in 2012, a study by Capgemini found that “change management should be a core competency in most organizations yet its survey of Norwegian business leaders found that 45 percent of all companies currently do not excel at change management”. 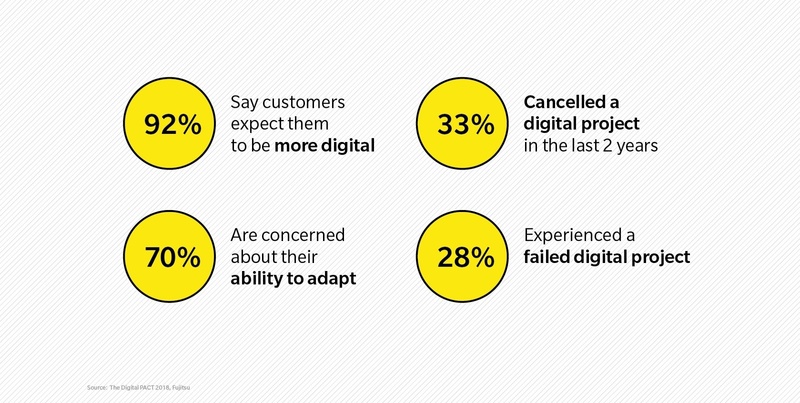 92 percent say that their customers expect them to be more digital. Business leaders today find themselves in a challenging climate—change efforts appear to be more likely to fail than to succeed. What can we learn from failure that will help business leaders chart a path to change management success? The Daimler-Chrysler and AOL-TimeWarner mergers are examples of large-scale change initiatives that had great promise but failed in the end. “Why have the DaimlerChrysler and AOL–Time Warner mergers become the benchmark against which bad strategic combinations are measured?”, Bill Pasmore asks in his book “Leading Continuous Change”. “In the various autopsies that were conducted, the explanation offered most frequently was simple: their cultures didn’t fit together”, Bill Pasmore says in Leading Continuous Change. “The Daimler-Chrysler merger was concluded to be a “culture mismatch”, Manju Thomas shares in a LinkedIn presentation. Their conclusion was that “The aggressive and, many said, arrogant AOL people ‘horrified’ the more staid and corporate Time Warner side. Cooperation and promised synergies failed to materialize as mutual disrespect came to color their relationships”, and, eventually, their business results. In both merger stories, the people aspect of the organisations took a back seat. The speed and delivery of the intended results were pursued without giving due importance to involving and navigating their people through change. Click here to read about a Leader's role in Leading & Managing Change. Bradway spent months discussing key risks with his leadership team. Bradway appointed a trusted senior executive as Chief Transformation Officer. Chief Transformation Officer Brian McNamee set up an extensive feedback loop to measure progress—allowed the company to adjust the plan every four-to-six months and each initiative monthly. McNamee deployed a "change-agent network,” a group of trusted leaders in the field, to understand how the transformation was affecting the organization. The leadership team listened to frontline managers' concerns and advice, building credibility in the process. Amgen's upfront efforts to help people understand the transformation supported the momentum for change even when people's energy inevitably flagged at the midway point. After two years, the company's margins had risen by 15 points and the stock price had doubled. Support for the company and the CEO predictably dipped one year into the effort, but at two years, it had rebounded to a level higher than at the beginning of the transformation. Bradway's Glassdoor CEO approval rating rose 12 percentage points in the same period (data provided by Glassdoor). His current rating is 76%. The people aspect alone is not a determinant of success, but it can make or break your change initiative. Understanding where the people are at and establishing buy-in are key to managing successful change. It is the senior leaders’ responsibility to listen to their people’s responses to change. Understanding how each person in the team is responding to it will determine how to engage them and the roles they can play in the process. Bain shares that “Although only 12% of companies make good on their transformation goals, there's a proven path for others to replicate their success. Leaders invest the time and resources to understand how change is likely to disrupt the organization and who will be hit hardest”. There will be individuals who will be very open to change, while others who feel strongly that the change should not occur and will resist it. Change leaders need to engage people according to their levels of openness. As organisations prioritise leading and navigating people through change, we believe we will begin to see the change failure percentages decrease. 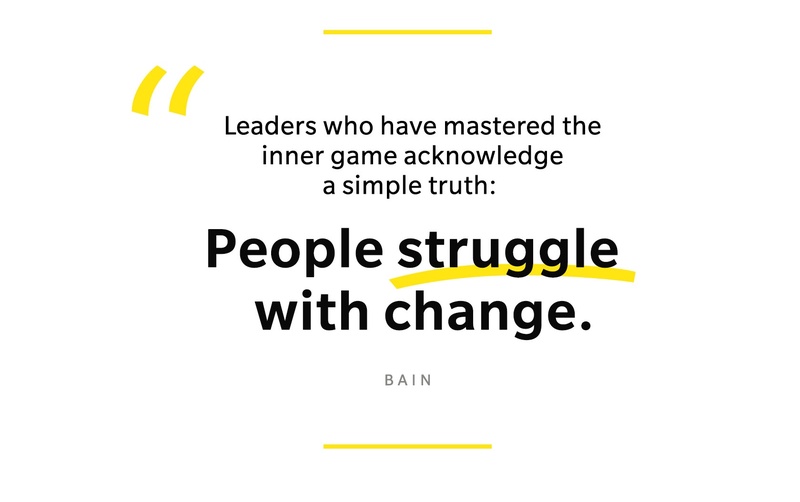 Leading and navigating your people through change increases the likelihood for success in organisational change and transformation.